For Nelle’s birthday in September this year, I made a donation to the Now I Lay Me Down to Sleep Foundation. For parents that want it, the gift of remembrance photography is a beautiful one. Even though we chose not to do photos with Nelle or Iris, I think that the mission of NILMDTS is an important one. Many of the parents I have come to know treasure the photos of their babies, as much as I treasure the footprints I have of my girls. It seemed like the perfect gift in honor of her. Today, I was scrolling through Instagram, and I follow NILMDTS. A thank you was posted for all of the gifts made “In Memory Of” in the month of September. 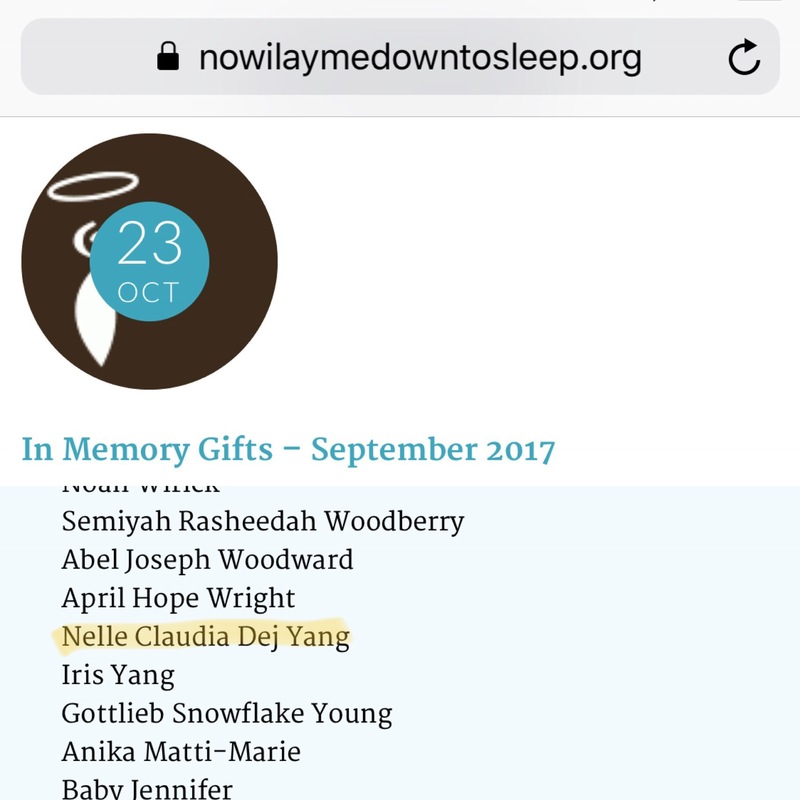 I clicked over to the site and there was her name: Nelle Claudia Dej Yang, along with all of the other babies’ names. I will never get to see her name on a report card, or recital program, or piece of mail. I sometimes struggle to say her name out loud, though it crosses my mind with ease. I want to hear it, out loud, but it hurts to hear it. Seeing her name, spelled out, each letter, acknowledgment that she existed, made me smile and cry. She was here. From the moment I knew I was pregnant, she was here. I had to stop and let my heart hurt for several moments, as once again sobs came harshly from the depths of my chest. Seeing her name… one of those physical grief moments. When I had composed myself (and by composed myself, I mean I could open my eyes), I took a picture of her name. I continue to collect these small moments, the way I would have saved anything with my child’s name in print. I can still be her mommy that way.